Welcome to The Kineticist! Slip on your boogie glasses, and click around to see the world from a fresh, kinetic perspective. From trampoline walkways, to treadmill desks, to spinning sculptures and amazing dance videos (AKA “kinetic catnip”), The Kineticist brings you a wide range of movement ideas from around the globe. You don’t have to go to an exercise class, the theater, or be a dancer; kinetic experiences are available all around us. Here you’ll find innovative movement ideas in cities, offices, education, art, science and more. You’ll be inspired by physical expression available to all, and find ways to integrate that expression in your daily life. If you are someone who experiences the world in a physical way, The Kineticist is tailor-made for you. If you are someone looking to bring more movement and physical awareness into your daily life, you have come to the right place. Joanne has been wiggling on, climbing and breaking uncomfortable chairs since she was a toddler. She studied ballet and modern dance as a youngster in Evanston, Illinois, then went on to dance and choreograph professionally in San Francisco and New York. In the 90’s, she worked with OnSite Dance Company, KneeJerk Dance Project, Jon Weaver, Jennifer Monson and others. Her dance-performance troupe Gravytrain was known for its “witty, rhythmically fluent” style and performed in many venues in the Bay Area, Chicago, and New York. 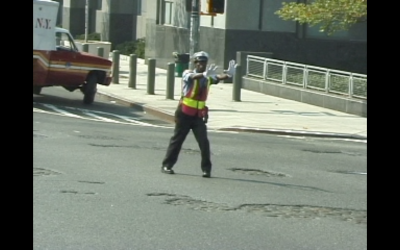 On her first day to her first full-time desk job at the Brooklyn Children’s Museum in 1998, Joanne drove through an intersection at the base of the Manhattan bridge. In that intersection was dancing traffic cop, Roland Michael Joseph, who literally conducted four streams of traffic with twinkly-toed grace and smooth aplomb. He offerred drivers high-fives, spun to stop oncoming cars, and jogged backward while whistling at the windshields.